Despite the very strange experiences I have had at UBC, I still love visiting the campus. This time, I wanted to visit the Asian Centre because I'm Asian. It was very cold outside, so I had to step inside the Irving Centre to warm myself up. I ended up warming up my hangry senses instead, as the whole study area was filled with the rich aroma of soups and herbs. I could not understand how everyone managed to study so diligently. As I continued my trek towards the residential buildings near the Asian Centre, the fragrance of grilled chicken filled the air. Even the garbage dump smelled like delicious barbecued food! That left me with no choice but to go on a sushi adventure immediately. 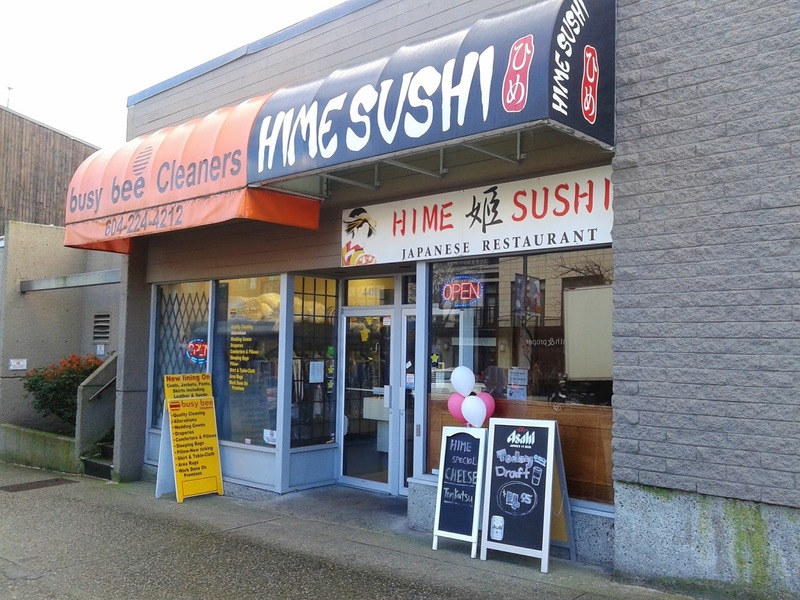 Just a 5-minute bus ride from UBC is Hime Sushi, a small but popular Korean-operated Japanese restaurant. Somehow, they managed to hide themselves very well from me. My bus stopped right in front of the restaurant, but I managed to miss it completely and walked two whole blocks astray before realizing that I was heading in the wrong direction. 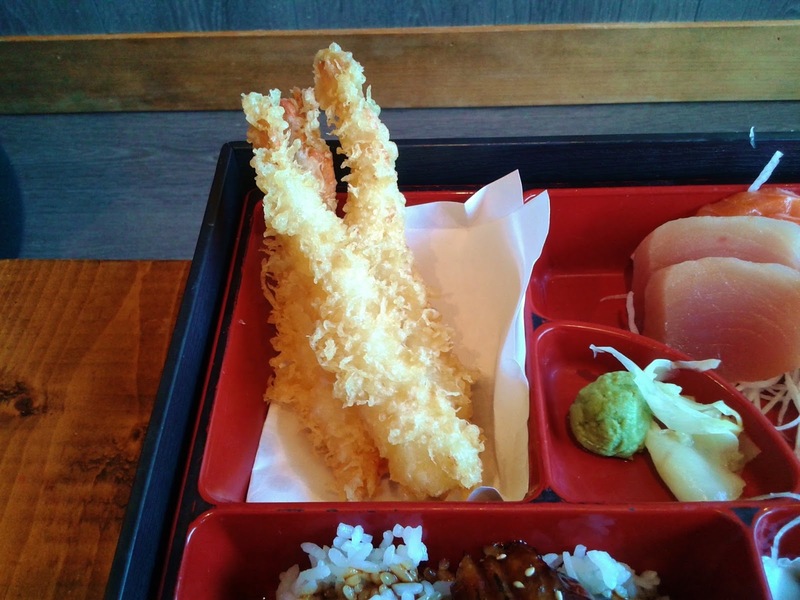 When I finally found the restaurant, the servers were extremely busy with what seemed like a mountain of takeout orders, and as a result, the service was a little slow at the beginning of my visit. Despite the slow start to the service, they brought out my Miso Soup (a part of the Bento C) very quickly. In fact, they brought out my food so quickly that I had to borrow the table next to me. I must have gotten a few weird stares for ordering so much food. 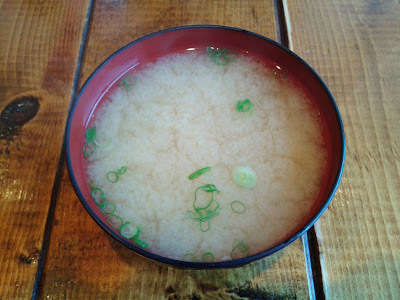 Back to the Miso Soup, it was steaming hot and garnished with green onion and tofu. 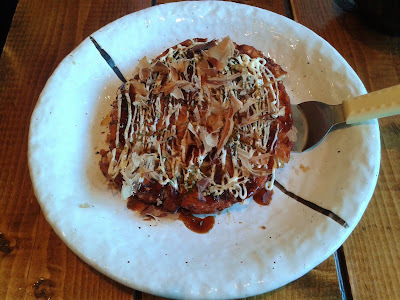 The Okonomiyaki was neatly constructed and not large (it was just $5.95). The exterior was slightly crispy and the breading was soft. The interior tasted a lot like gyoza filling, which was dressed with a reasonable amount of Worcestershire sauce on top. For my special roll, I chose the Ocean Red Roll, which consisted of marinated spicy tuna, green onions, and wild sockeye salmon. Each piece of the roll had a small piece of sockeye salmon on top, and the salmon was fresh albeit not very smooth texture-wise. They added quite a bit of spicy chili sauce to the spicy tuna, and I actually had a bit of trouble eating it. That being said, I'm not the most spice-tolerant person. Yes... after the okonomiyaki and the special roll, I still managed to finish the whole Bento C.
The Prawn Tempura came with three prawns. The batter on the prawns was a little on the thicker side, but I liked how it was crispy and not hard. The prawns were juicy with a nice savoury flavour. Freshness was apparent in all six pieces of sashimi, though the cuts were anything but generous. The Tuna Sashimi was soft and also a bit fatty. 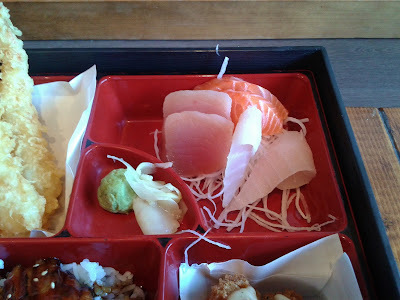 The Salmon Sashimi had a delectable buttery flavour, while the Tai Sashimi exhibited a delicate sweet flavour without being too chewy. 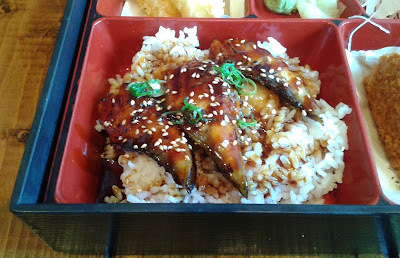 The Unagi Don came with three soft pieces of unagi that were dressed with lots of teriyaki sauce. As you can see from the photo, there was a puddle of teriyaki sauce on one side. 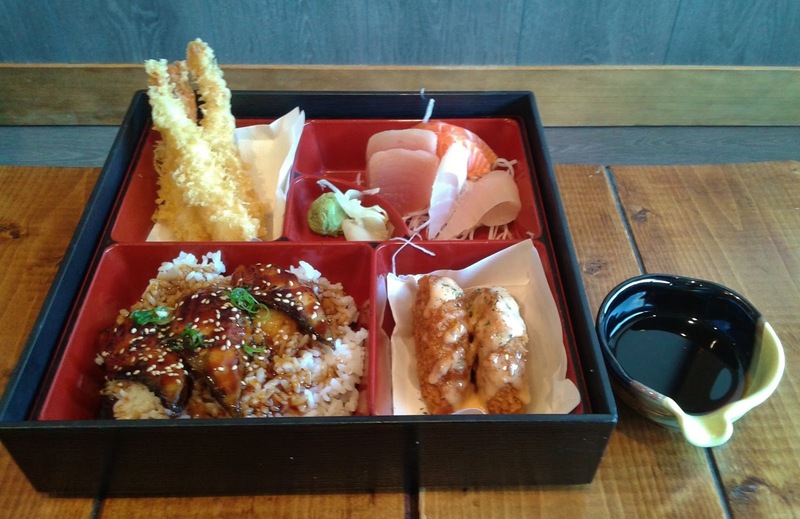 The sauce did too much of the work, and the unagi was somewhat overshadowed as a result. 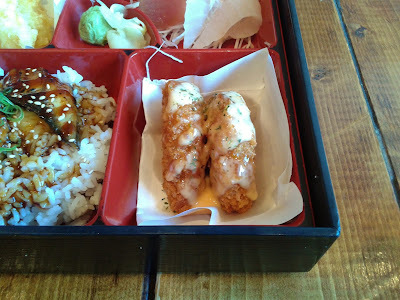 The highlight of the bento box was the Korokke, and its texture was just amazing. The breadcrumbs on the outside were crispy and not heavy or hard at all. The potato-based filling inside was very soft, with almost a melty texture, and was accentuated with a light sprinkling of herbs. A fine layer of Thousand Island dressing was the finishing touch of this irresistible croquette. The service was friendly once the waitresses finished dealing with the massive number of takeout orders. At one point, my miso soup got caught in one of the indentations on the wooden table, which made me pour soup all over my table, my napkin, and my phone. One of the waitresses quickly came over and rescued me with a stash of napkins, and most importantly, my sushi notebook was unharmed. Hime Sushi is not the place for big portions, but the food is consistent and carefully executed. "Despite the very strange experiences I have had at UBC" - ME. EVERYDAY. LOL I'm glad it's not only me with the very strange experiences. And about the Asian Centre... I rung that bell thingy and it sounded nice! It also looks like a nice place to study except for the barbecued food issue.